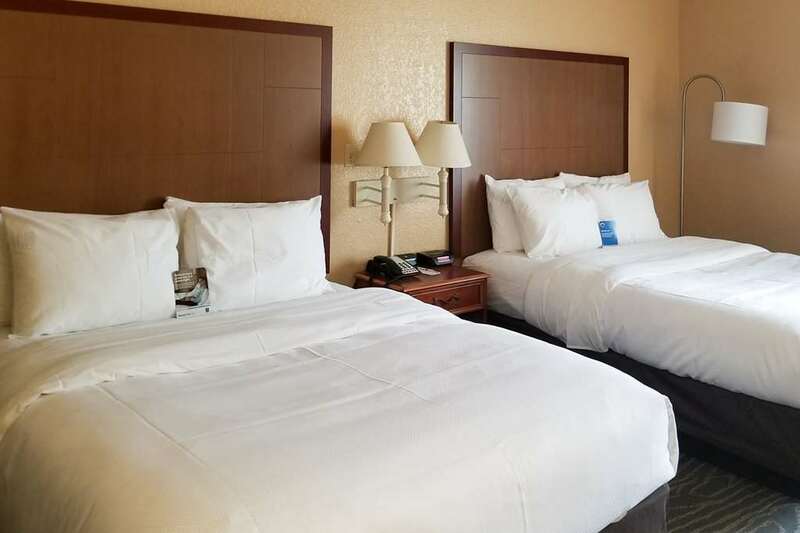 Whether your San Antonio getaway is work-related or you are looking for a vacation hotel, you are sure to get a great night of rest at our Comfort Inn and Suites Near Six Flags and Medical Center. Amenities include free WiFi, free hot breakfast, a fitness center, meeting space and guest laundry services. Guest rooms feature a microwave and refrigerator, USB ports, a coffee maker. Work desk and 32-inch TV with premium cable channels. Our location off Interstate 10 puts us close to businesses like Valero and the USAA Headquarters and attractions like Six Flags Fiesta Texas, The Shops at La Cantera, University of Texas at San Antonio and SeaWorld San Antonio. You can also earn rewards when you join our Choice Privileges program. Pets allowed. 50 USD per stay. A maximum of 35 pounds and a maximum of 2 pets per room. 100 USD refundable deposit required.